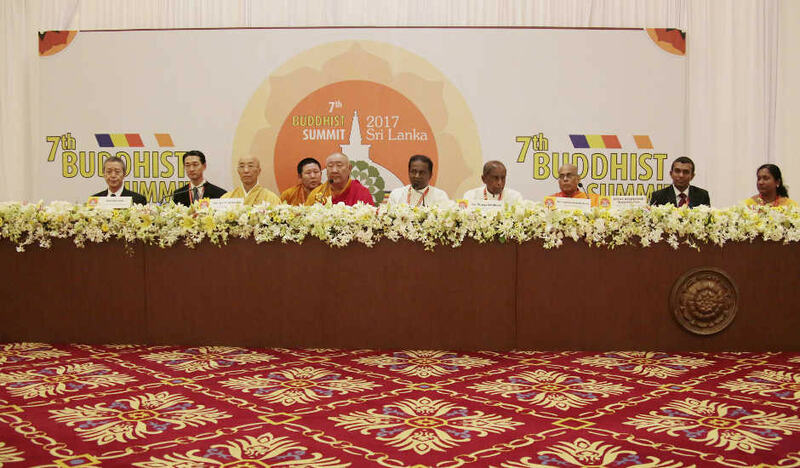 The Seventh Buddhist Summit was grandly held from November 2 to 7, 2017 in Sri Lanka, a leading country of Theravada Buddhism, as a national event under the auspices of the government of Sri Lanka in the presence of H.E. 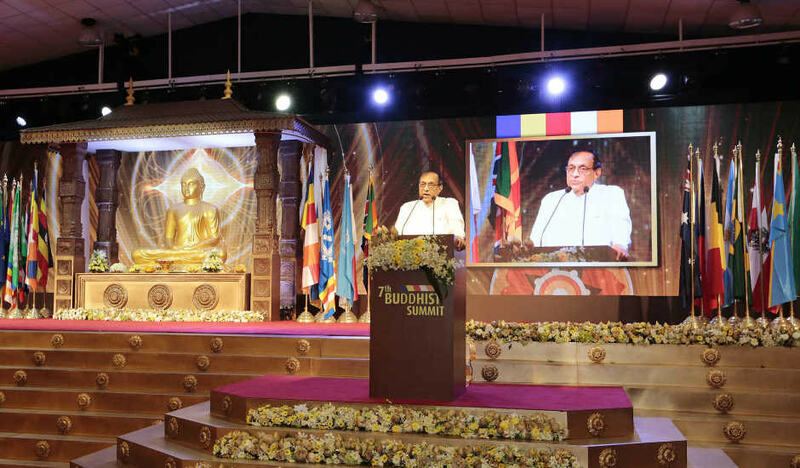 President Maithripala Sirisena as the chief guest and Hon. 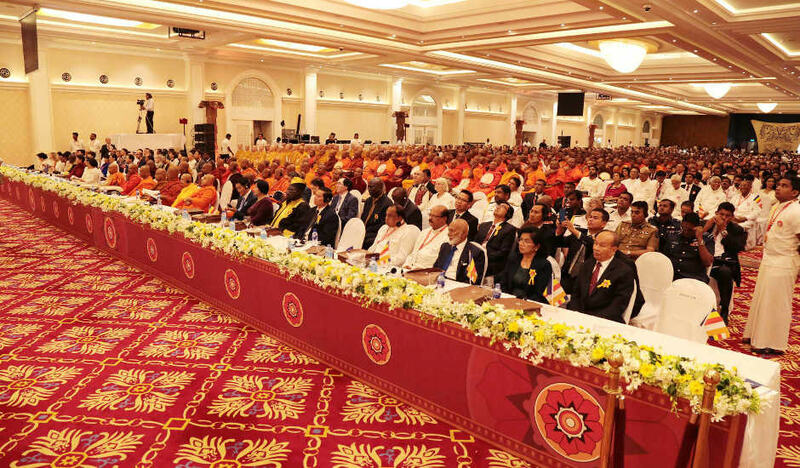 Prime Minister Ranil Wickremesinghe as the guest of honor. 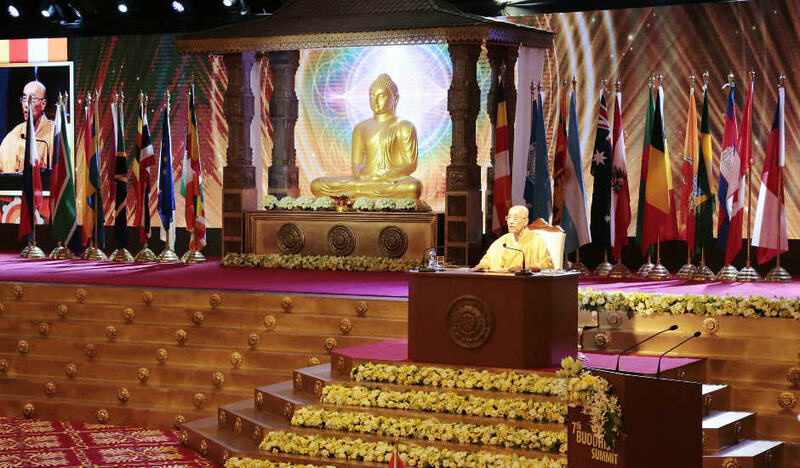 It was attended by the supreme Buddhist leaders of 47 countries across the 5 continents in the world as well as national leaders and members of the Royal Families. It was in the 3rd century B.C. 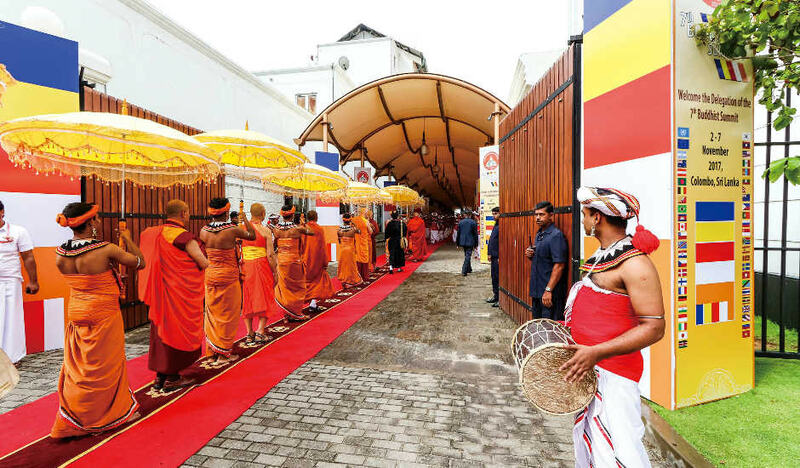 when Buddhism was introduced to Sri Lanka. 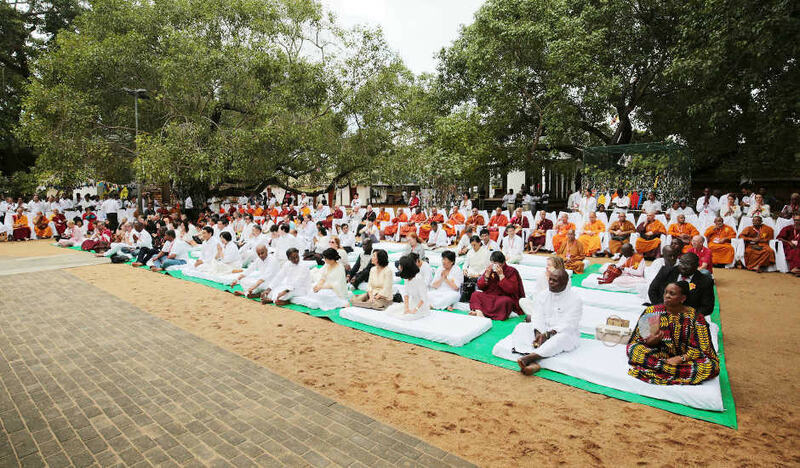 Since then, Sri Lanka has protected Buddhism for 2,300 years, overcoming various adversities. 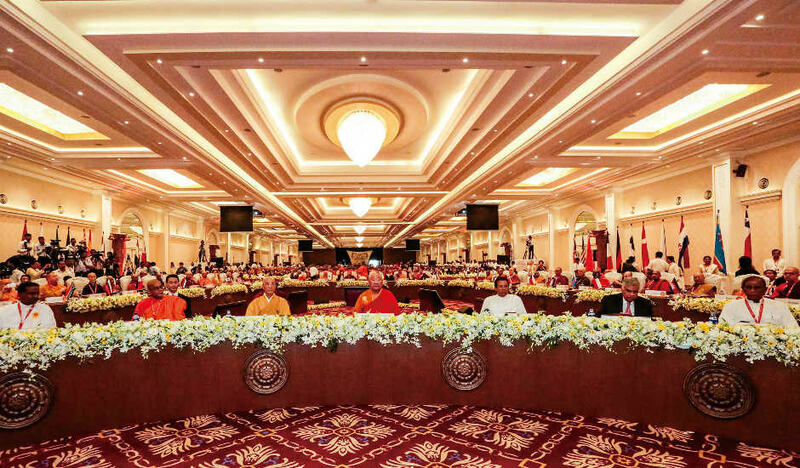 Now, the nation still gives much importance on Buddhism and the 3 major Nikayas, namely, Siam Nikaya, Amarapura Nikaya, and Ramanya Nikaya, are actively working to disseminate the teachings of Lord Buddha at home and overseas. 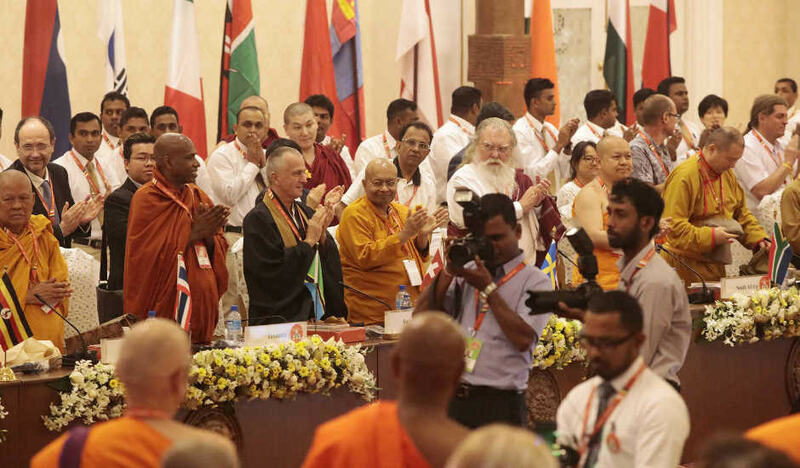 Indeed, Sri Lanka has an immeasurable influence on the Buddhist communities in the world. 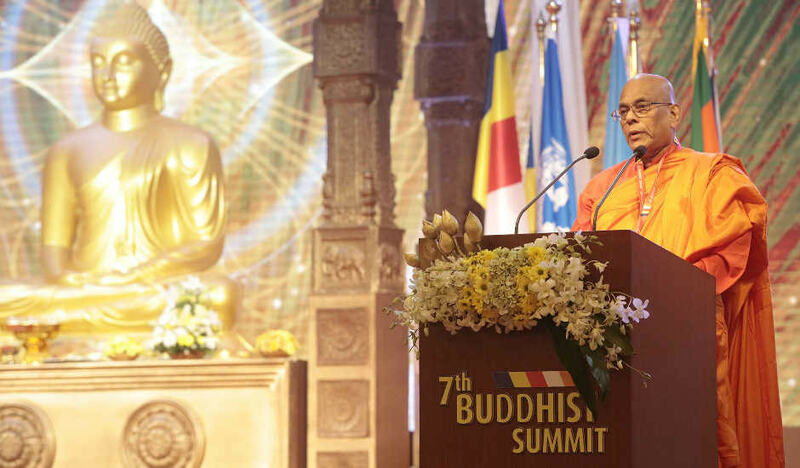 Sri Lanka put its national prestige on hosting the Seventh Buddhist Summit. 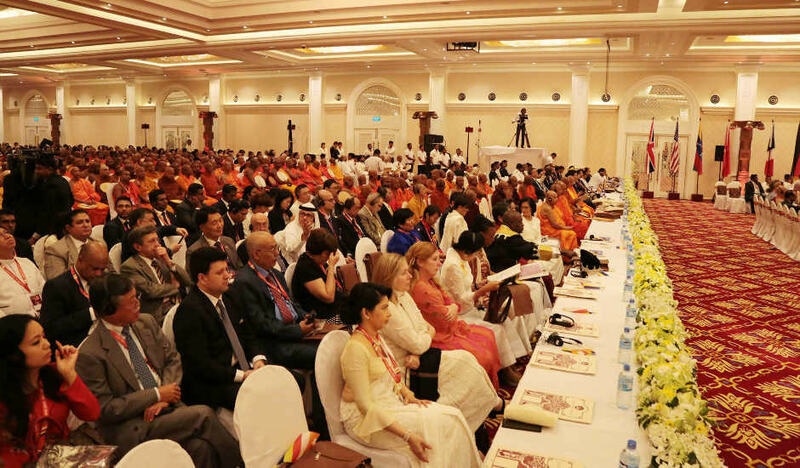 The conference produced a great outcome more than ever in sending a strong message of peace through Buddhism to the entire world. 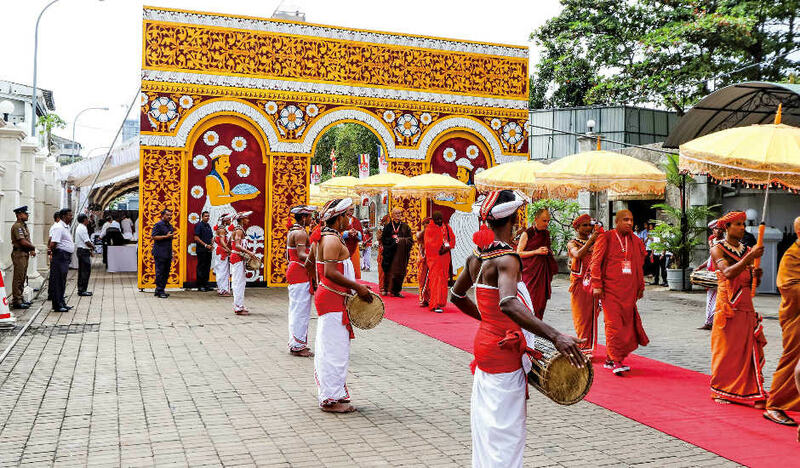 Procession of the supreme Buddhist leaders starting from the decorated arch. 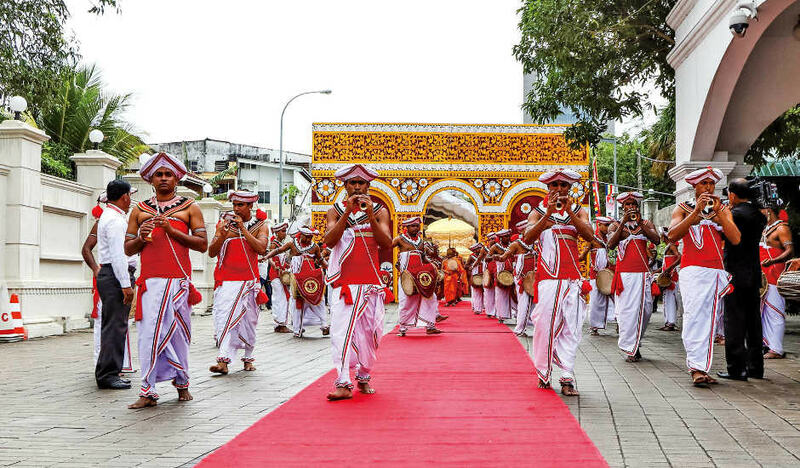 The sound of traditional Sri Lankan drums and trumpets echoed in the air. H.E. 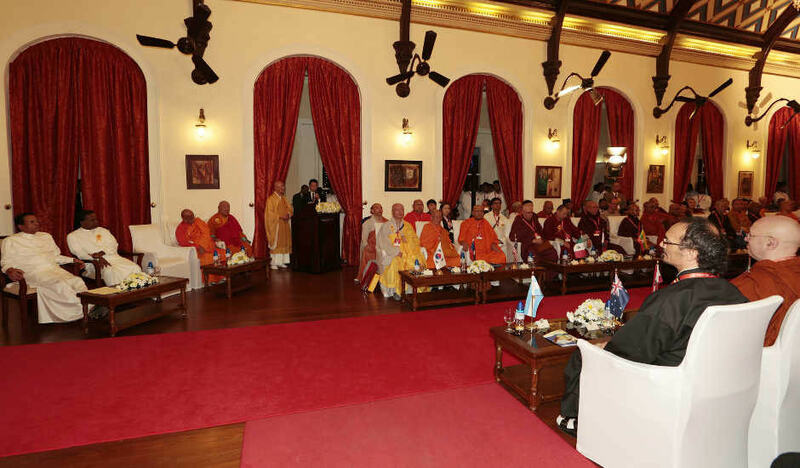 Khamba Lama Gabju Choijamts Demberel, President, Most Ven. 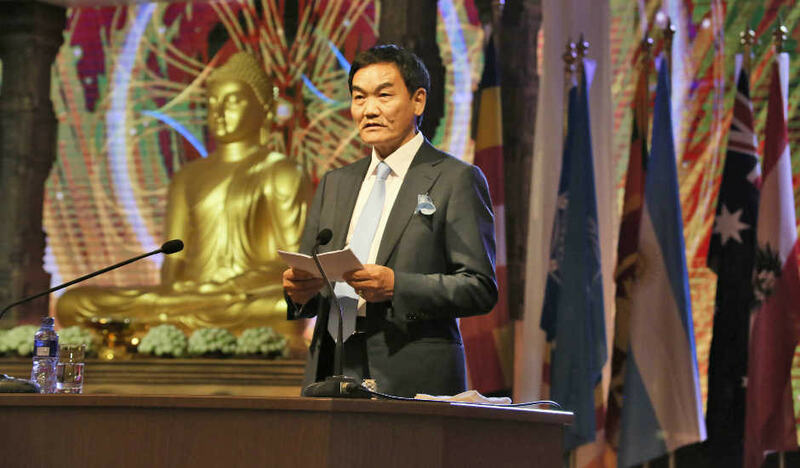 Dr. Shinkai Kori, Vice President, Most Ven. 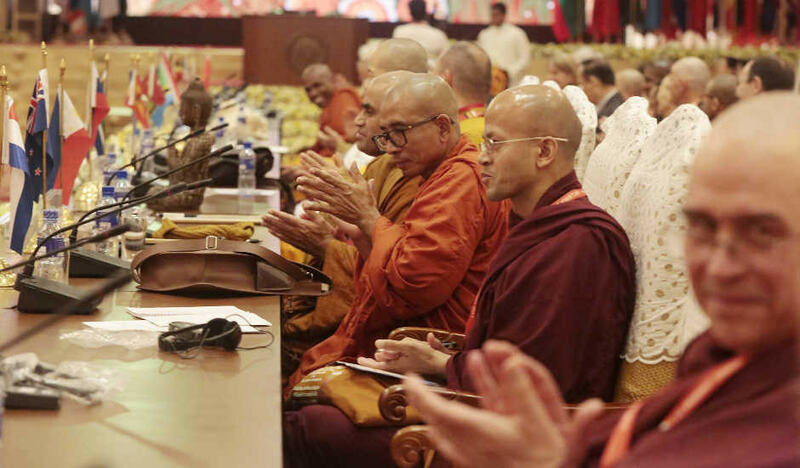 Weragoda Sarada Nayaka Maha Thero, Secretary General of Buddhist Summit, as well as H.E. 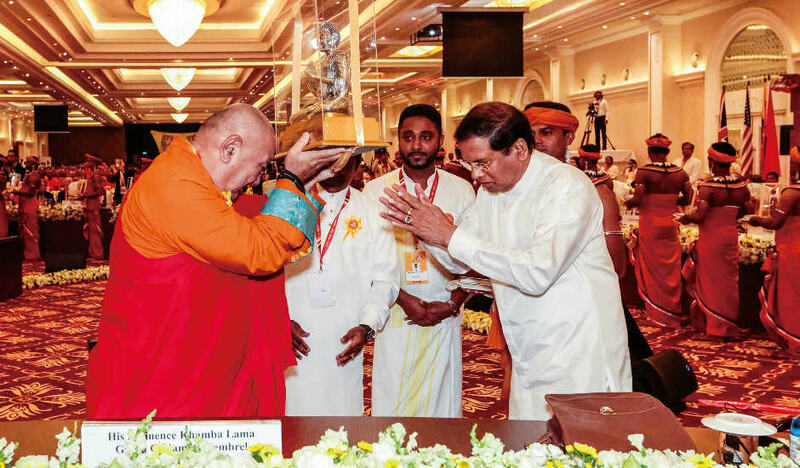 President Maithripala Sirisena, Hon. 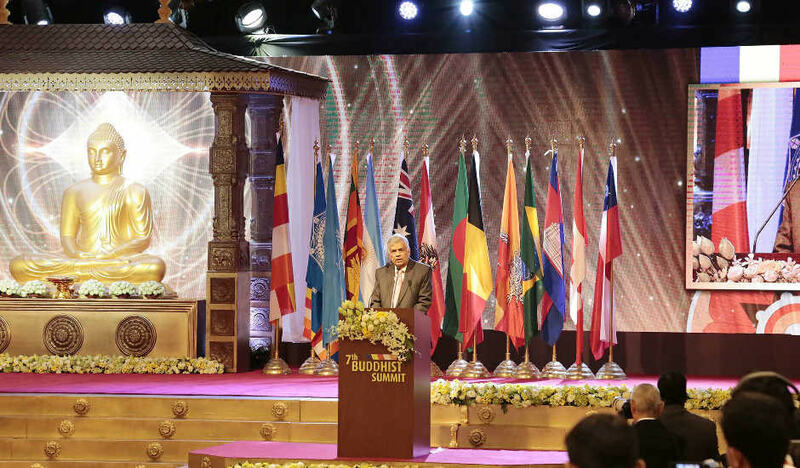 Prime Minister Ranil Wickremesinghe, Hon. 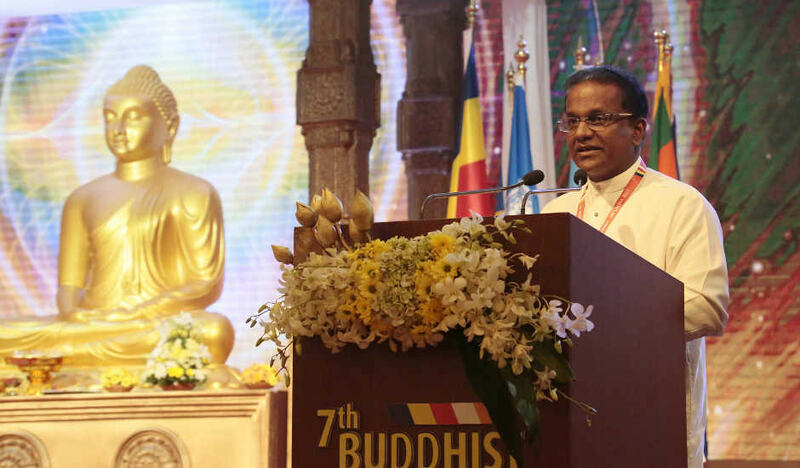 Minister of Buddhasasana Gamini Jayawickrama Perera, and Hon. 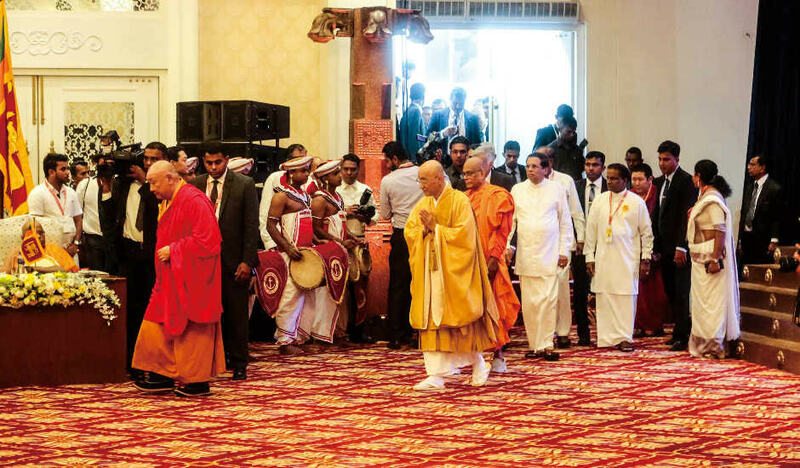 Deputy Speaker of the Parliament Thilanga Sumathipala of Sri Lanka, entering the hall. 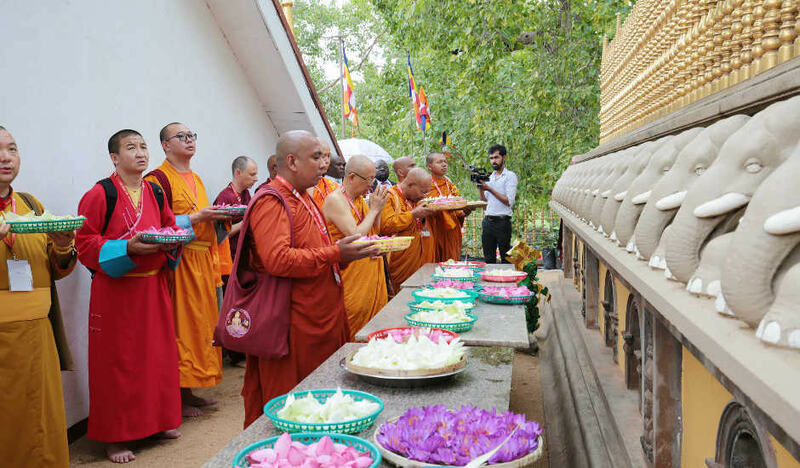 Offering flowers to the Buddha statue. 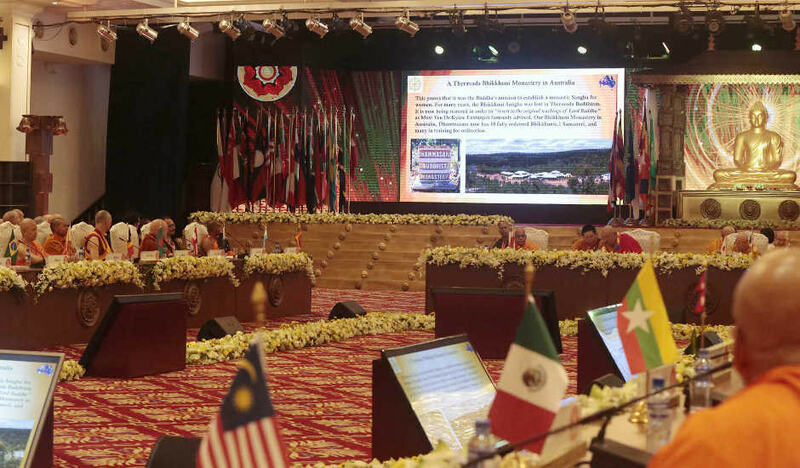 Opening address by H.E. 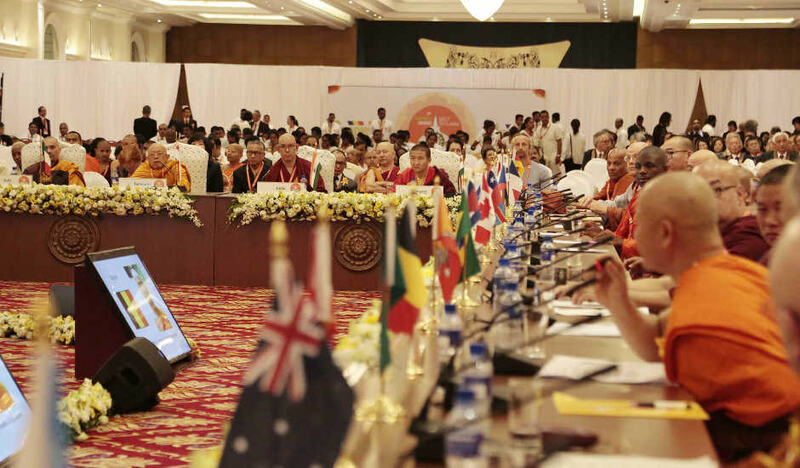 Khamba Lama Gabju Choijamts Demberel, President of Buddhist Summit. 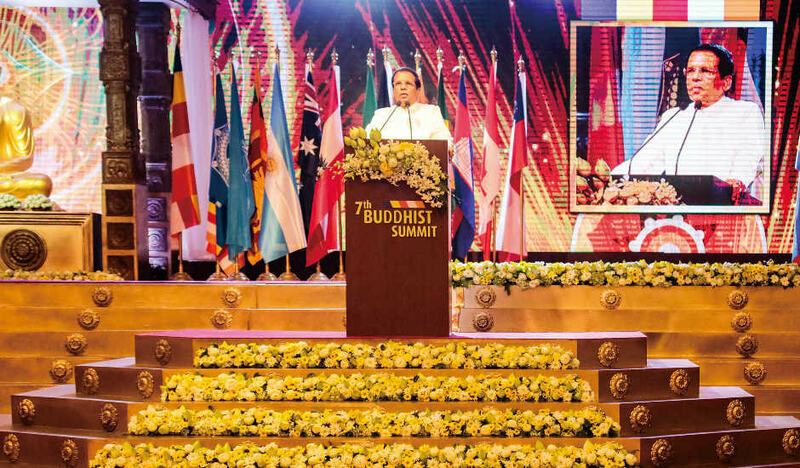 His Eminence praised the tradition and high status of the host country Sri Lanka and expressed his strong determination for the great success of the Seventh Buddhist Summit. Hon. 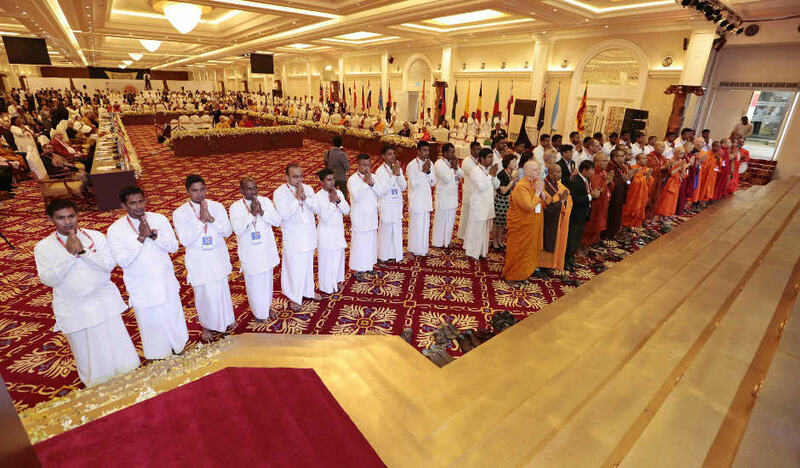 the Prime Minister, highlighting the importance of the coexistence among different communities and religions by respecting one another in order to realize peace in the world. H.E. 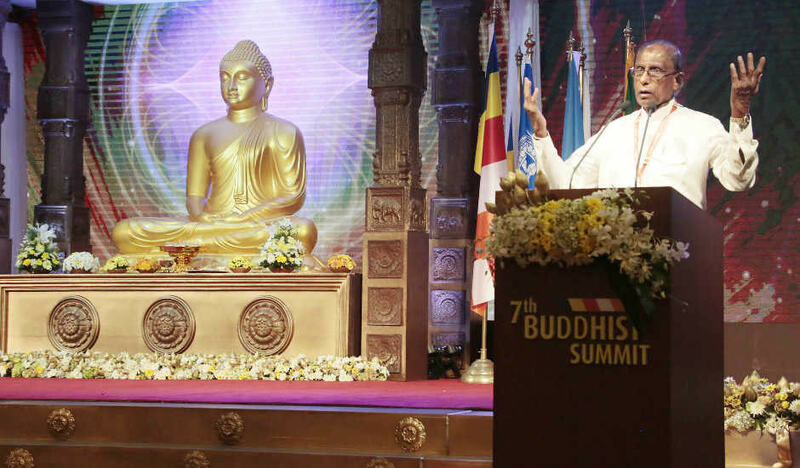 the President speaking about his pleasure of holding the Seventh Buddhist Summit in his country that has a long Buddhist history. 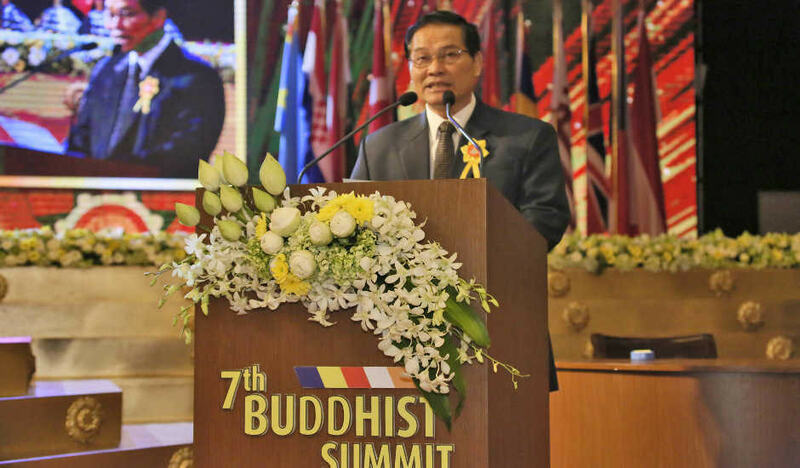 And His Excellency further stated that the Buddhist Summit conference would send a very significant message to the modern world suffering from numerous conflicts. H.E. 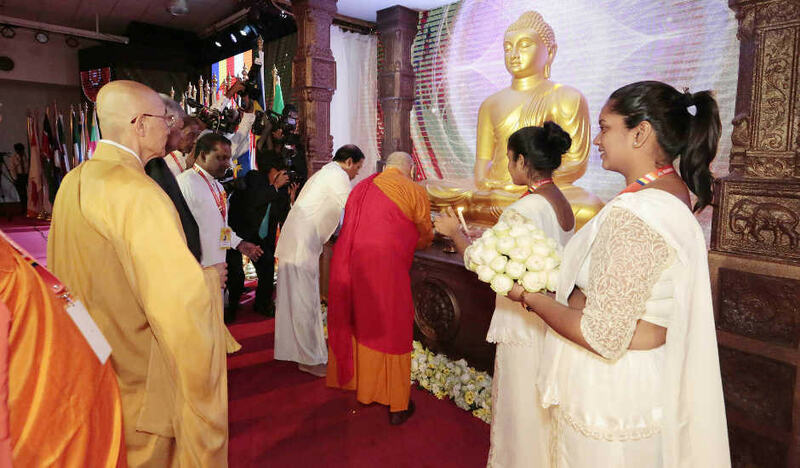 the President of Sri Lanka entrusting a Buddha image to H.E. 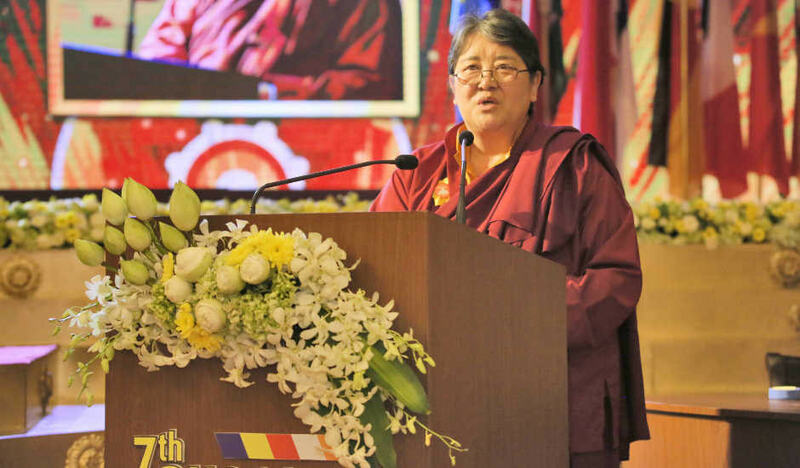 Khamba Lama Gabju Choijamts Demberel, President of Buddhist Summit. 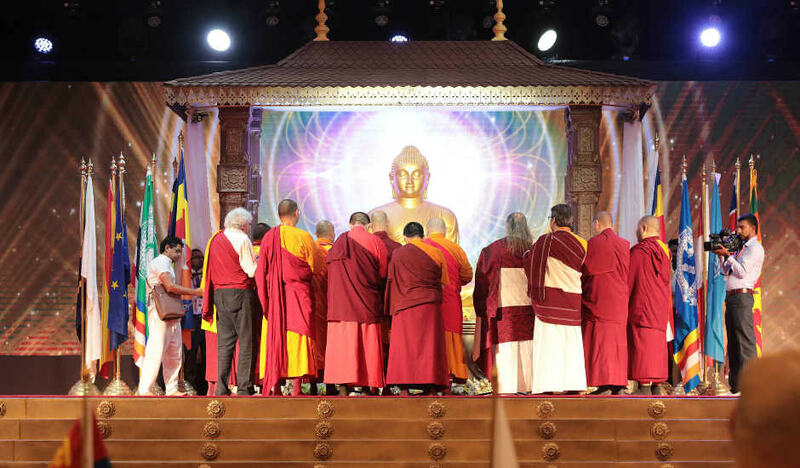 The Buddha image was specially made for Most Ven. 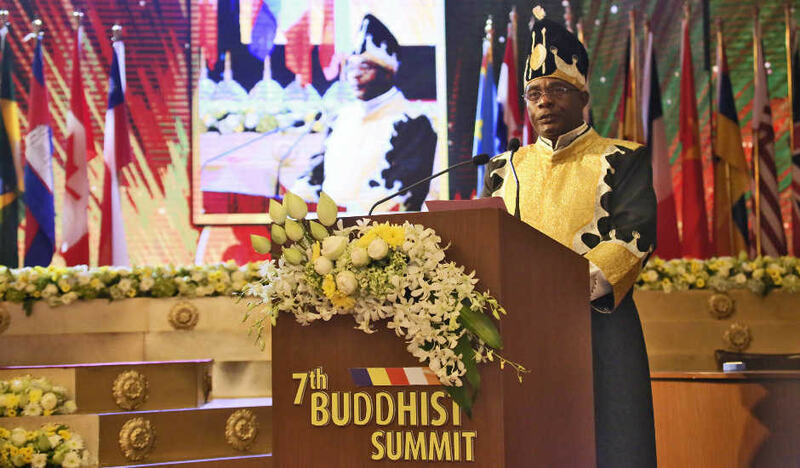 Dr. Kyuse Enshinjoh, Supreme Advisor to Buddhist Summit and Founder Priest of Nenbutsushu, in commemoration of the Seventh Buddhist Summit. 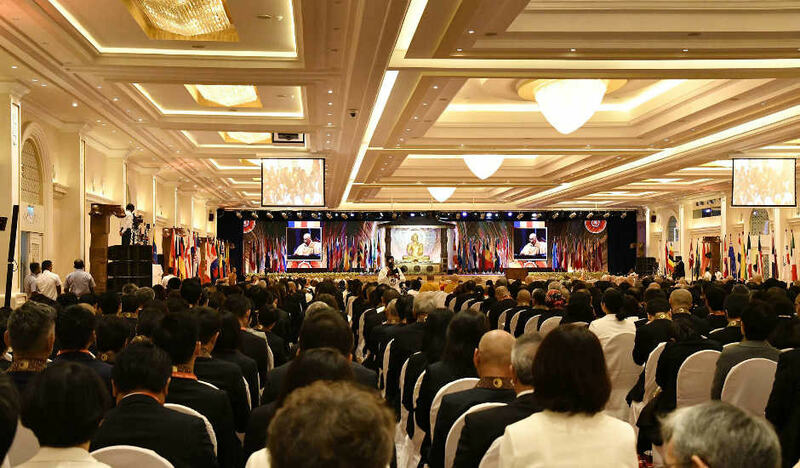 Supreme Buddhist leaders of the 47 countries assembling in one hall. 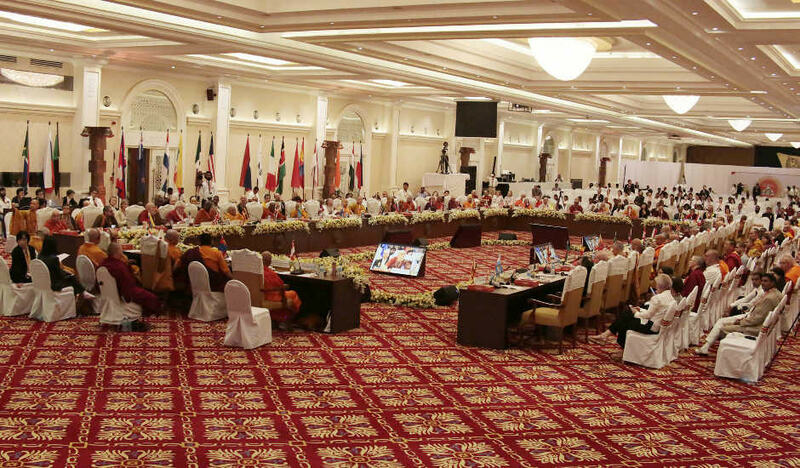 On the table and along the wall, the national flags of member countries are placed. 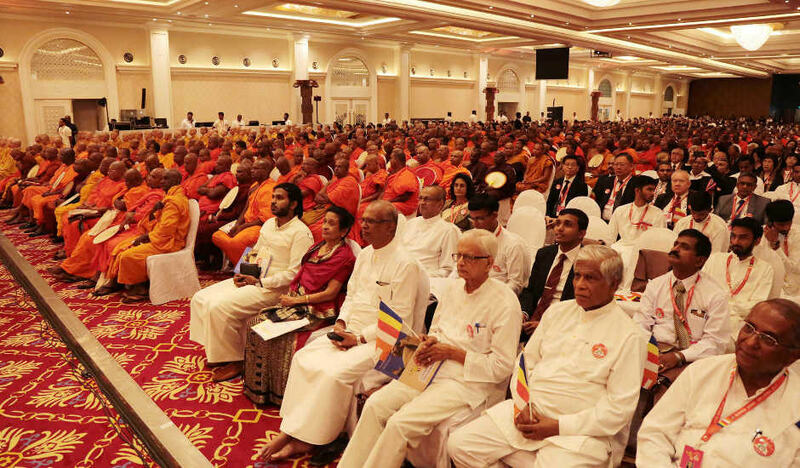 Royal Families, dignitaries from UN related organizations, Ambassadors Extraordinary and Plenipotentiary of various countries to Sri Lanka, and cultural figures, attending the grand opening ceremony together with many Buddhist monks from Sri Lanka and Japan. and the inspector general of police of Sri Lanka, watching the progress. 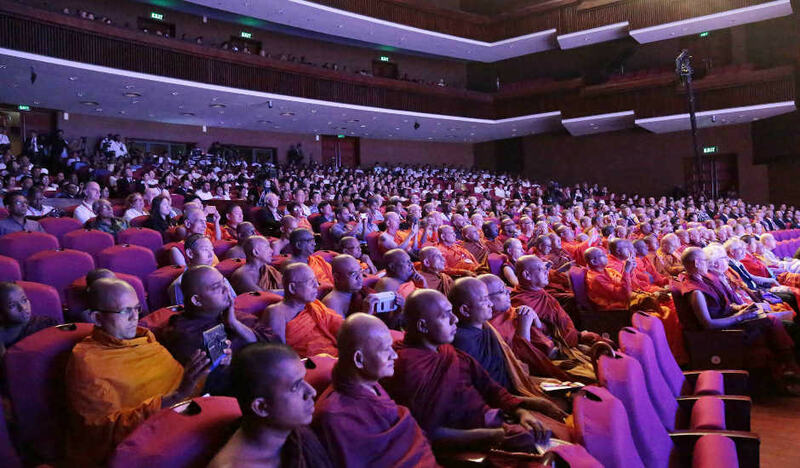 intently listening to His Most Venerable. 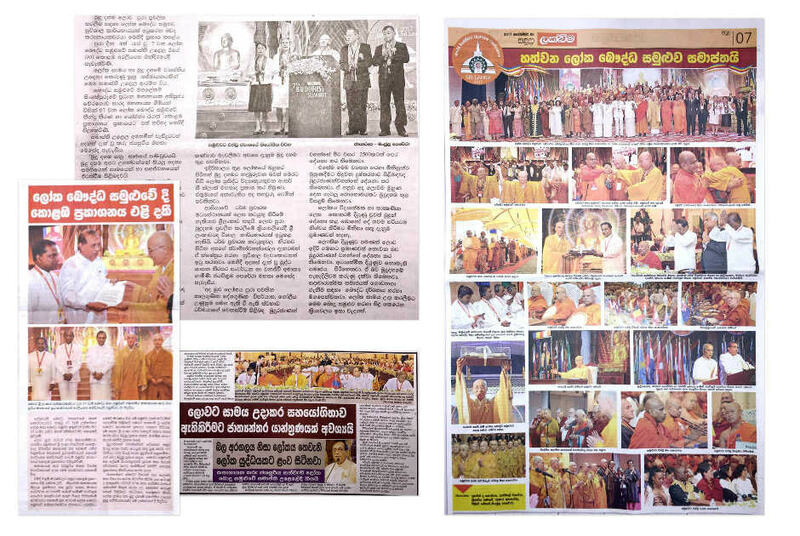 the keynote speech booklet written in 3 languages, Japanese, English, and Sinhalese, were distributed on site. 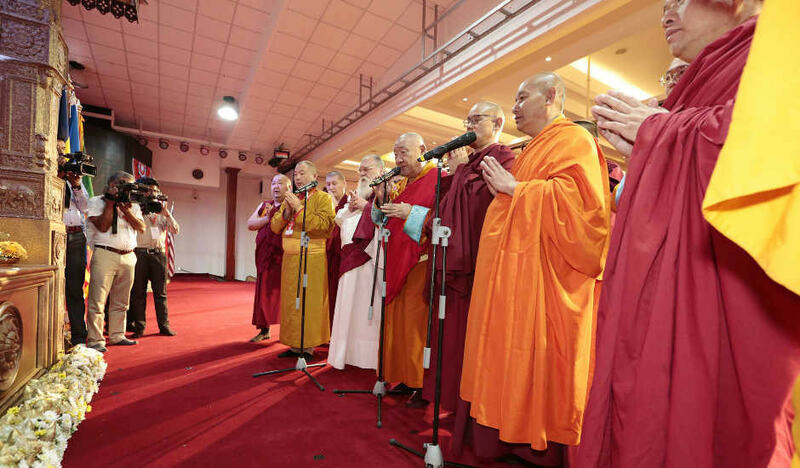 Address by Most Ven. 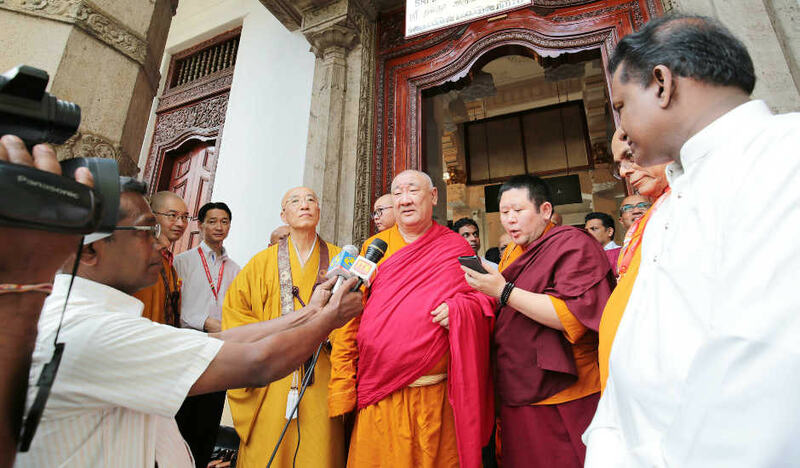 Weragoda Sarada Maha Thero of Singapore. 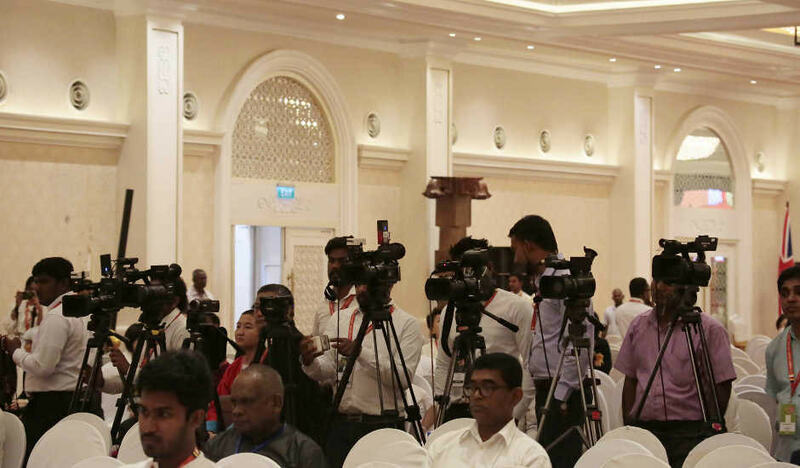 Special audience at the Official Residence of the President. Most Ven. 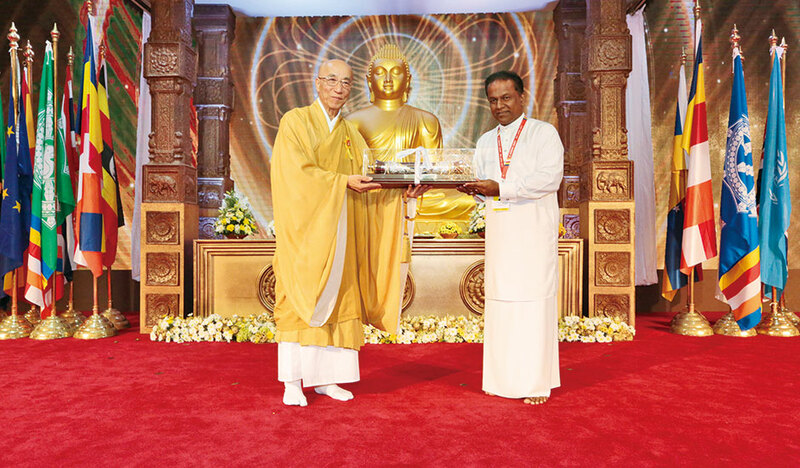 Dr. Shinkai Kori expressing sincere appreciation to H.E. 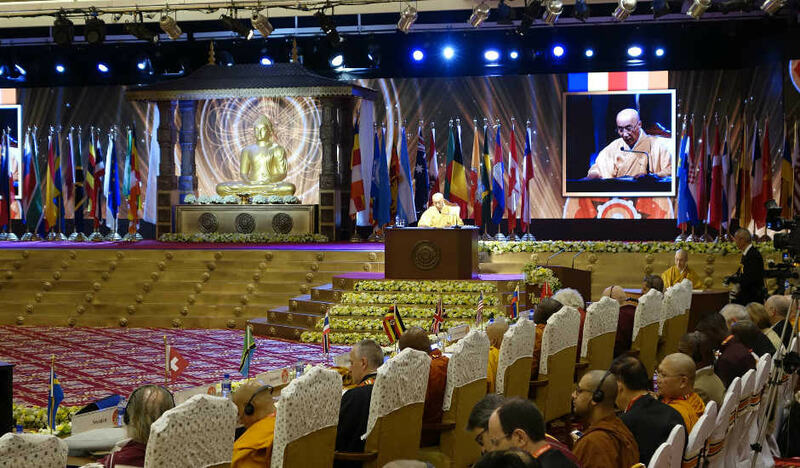 the President on behalf of the supreme Buddhist leaders of 47 countries in the world. 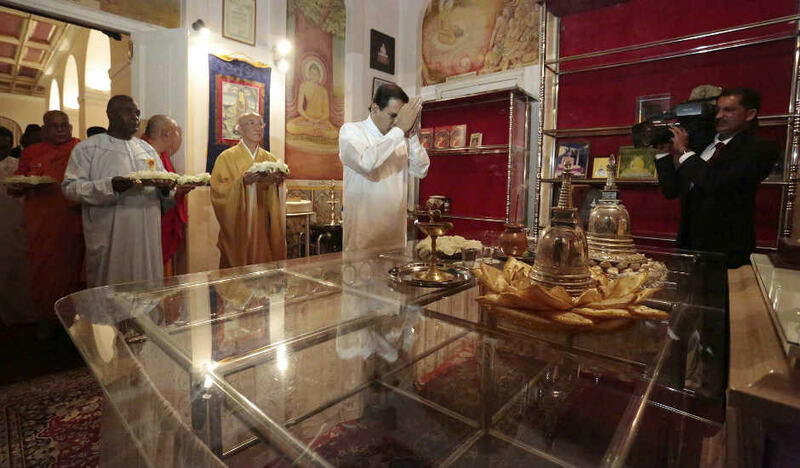 Offering flowers to the Buddha image of H.E. the President. H.E. 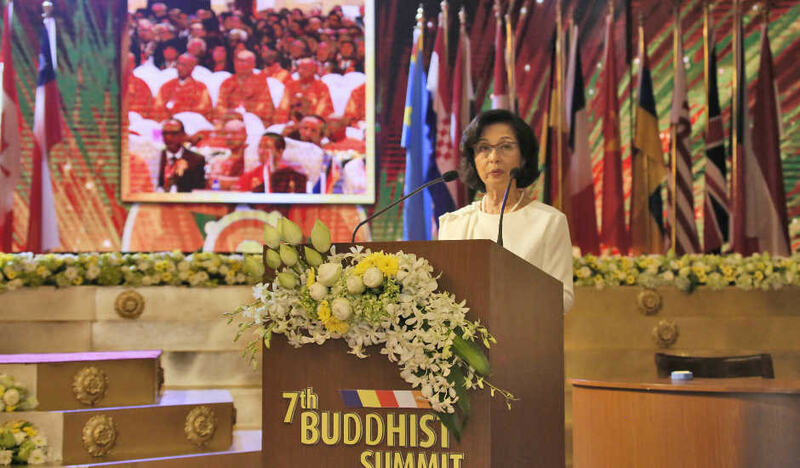 the President welcoming the representatives to Buddhist Summit and the honorable guests. 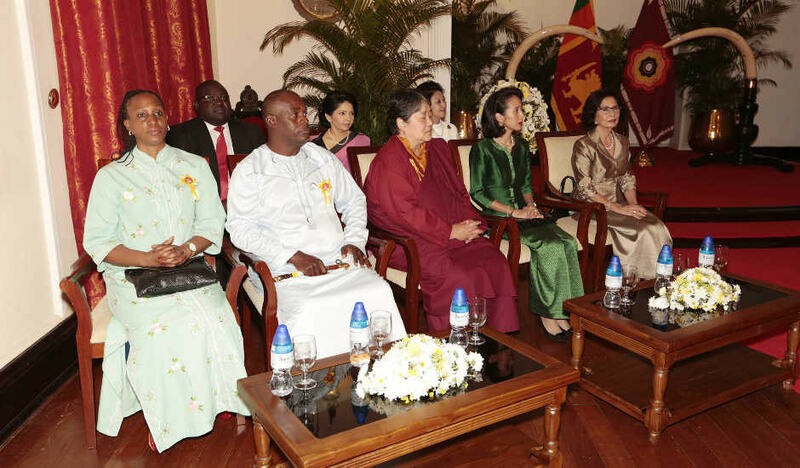 Members of Royal Families from overseas. 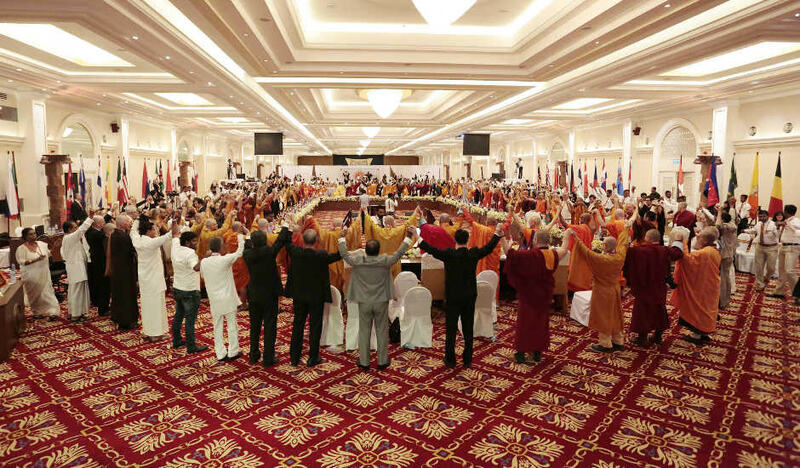 Strong unity After the round-table meeting, all the participants stood up and took each other’s hands. 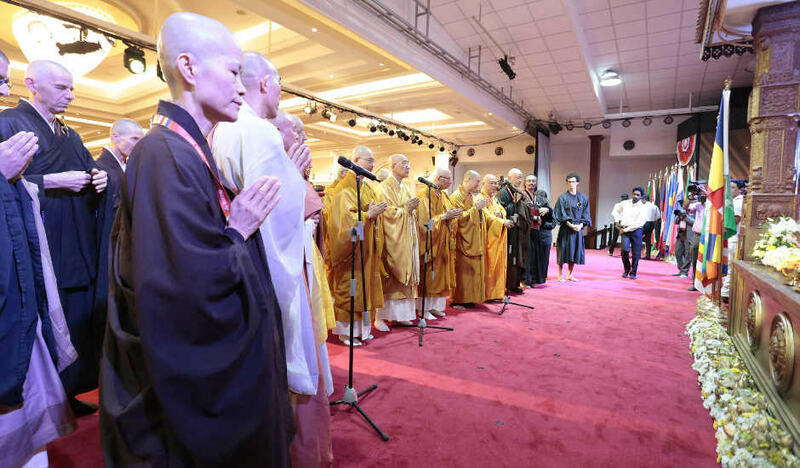 It was a significant moment for Buddhists in the world to strengthen the unity by overcoming the differences in race, nationality, and tradition (Nov. 4, 2017). 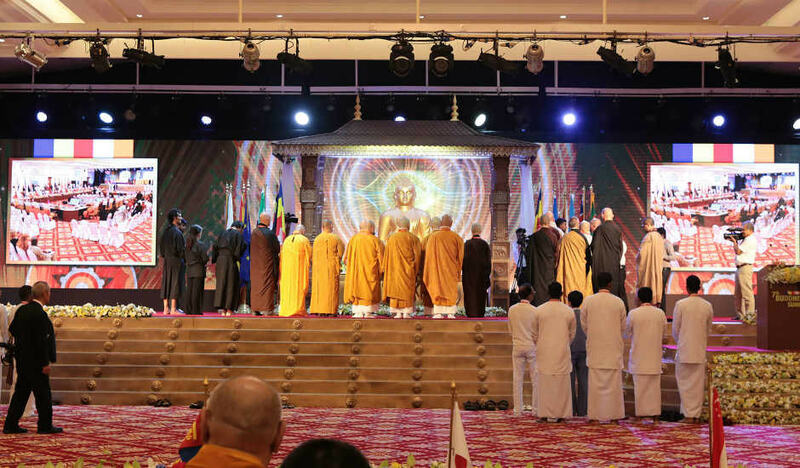 Supreme leaders of Theravada Buddhism putting their hands together in front of the stage. 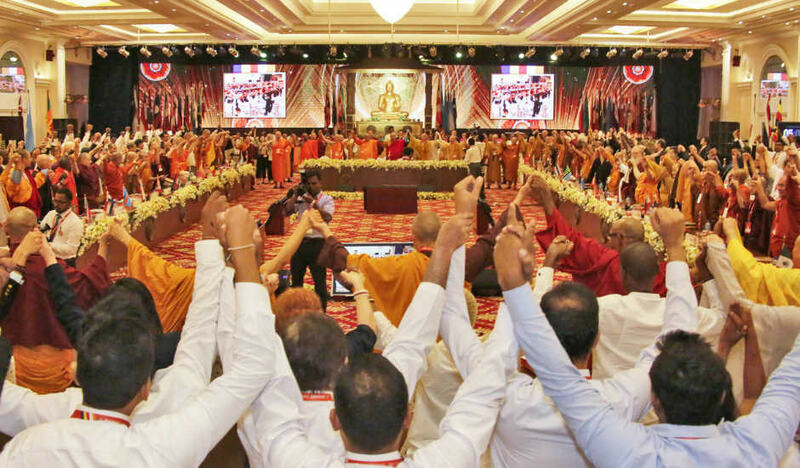 Liaison officers of Sri Lanka are also putting their hands together behind them. 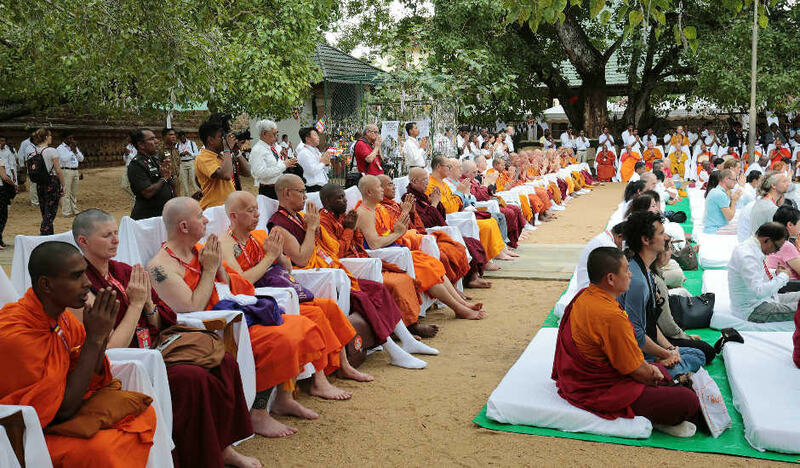 Chanting sutras by the supreme leaders of Mahayana Buddhism. 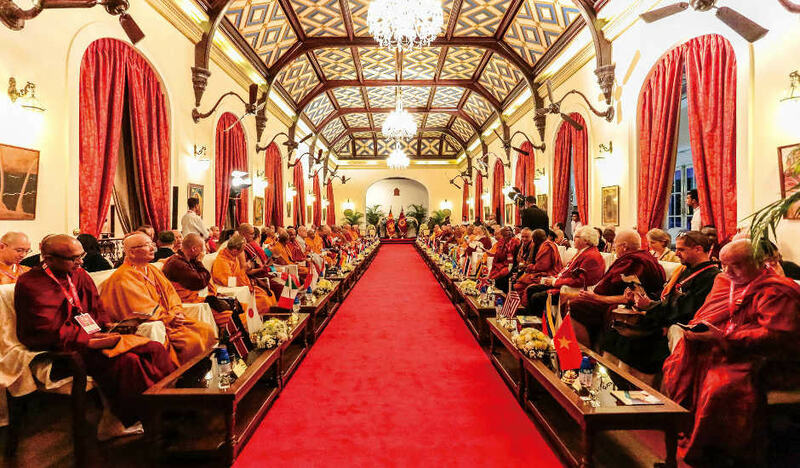 Chanting sutras by the supreme leaders of Vajrayana Buddhism. 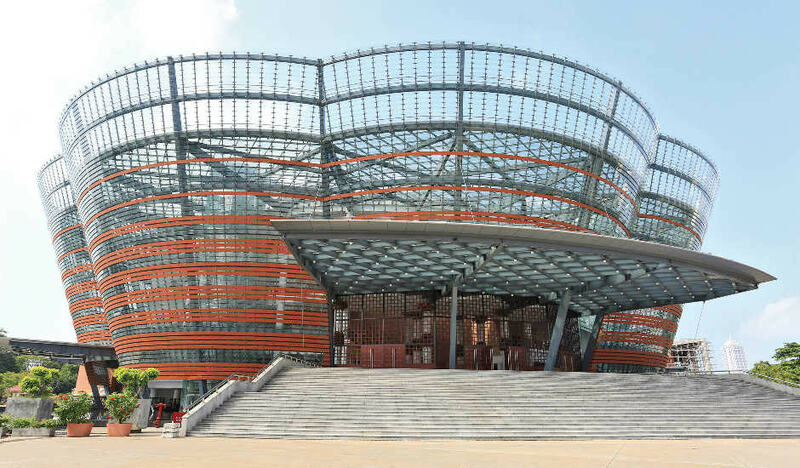 Address by Hon. Karu Jayasuriya, Speaker of the Parliament. Address by Hon. 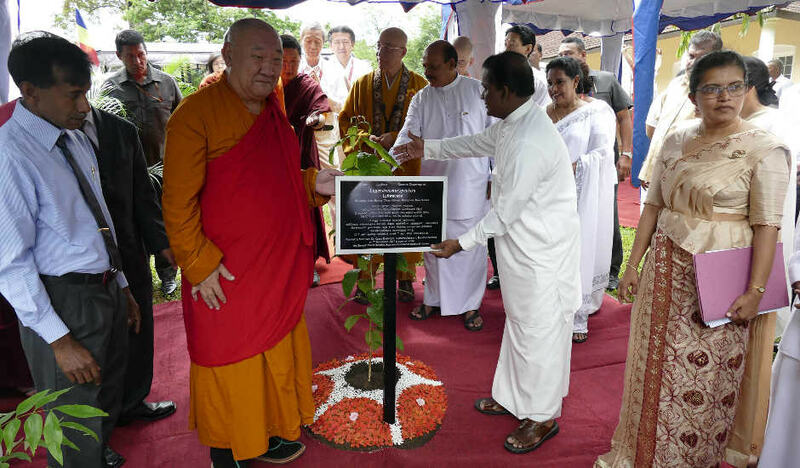 Gamini Jayawickrama Perera, Minister of Buddhasasana. 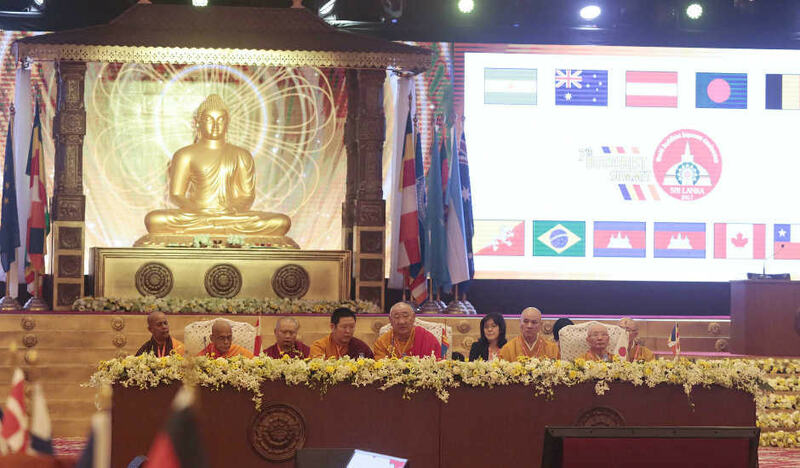 and Chairperson of the Organizing Committee for the Seventh Buddhist Summit. 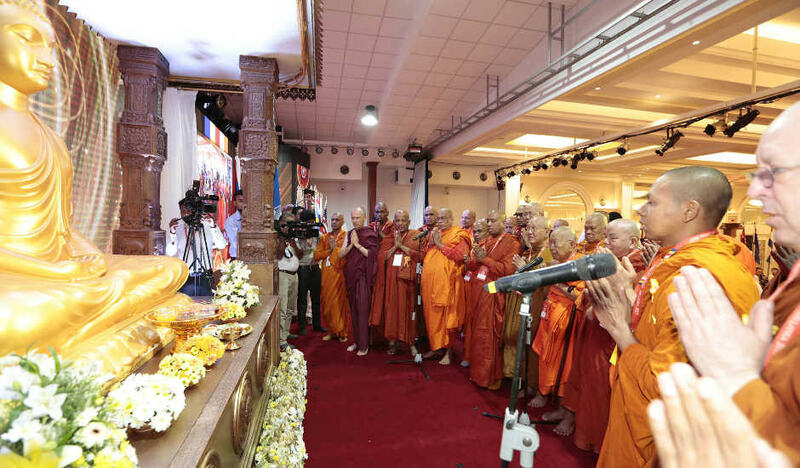 Handing the silver cylinder, in which the text of the Colombo Declaration is enclosed, to Most Ven. Dr. Shinkai Kori. 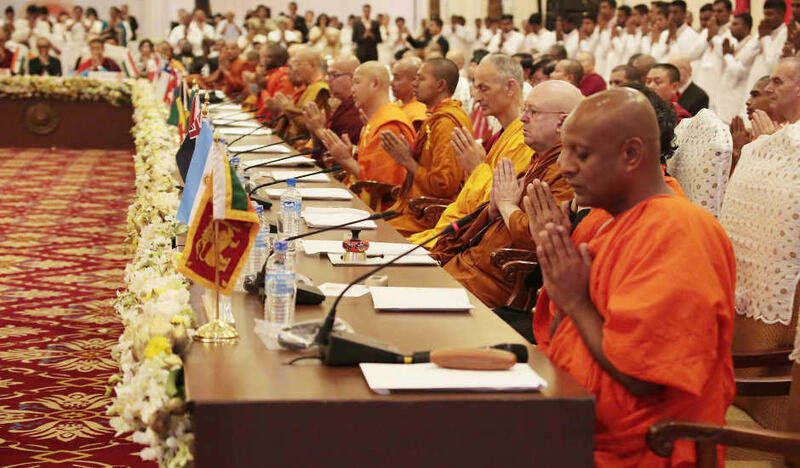 for world peace, the propagation of Buddhism, and further prosperity of Sri Lanka. 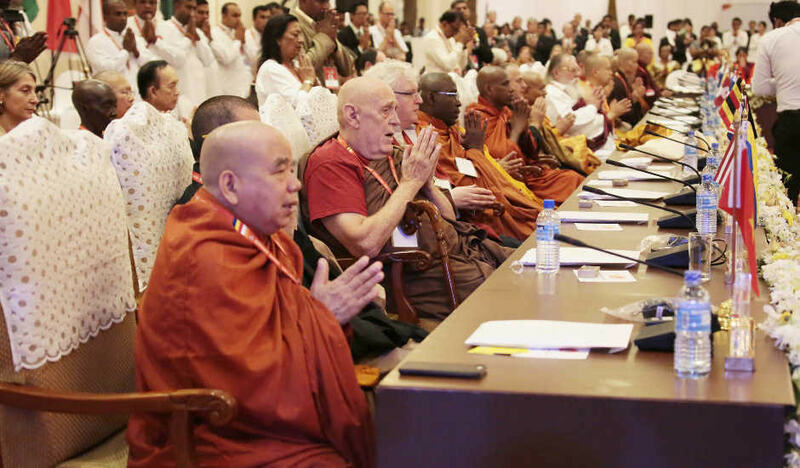 Holding each other’s hands with renewed determination for the further propagation of Buddhism. 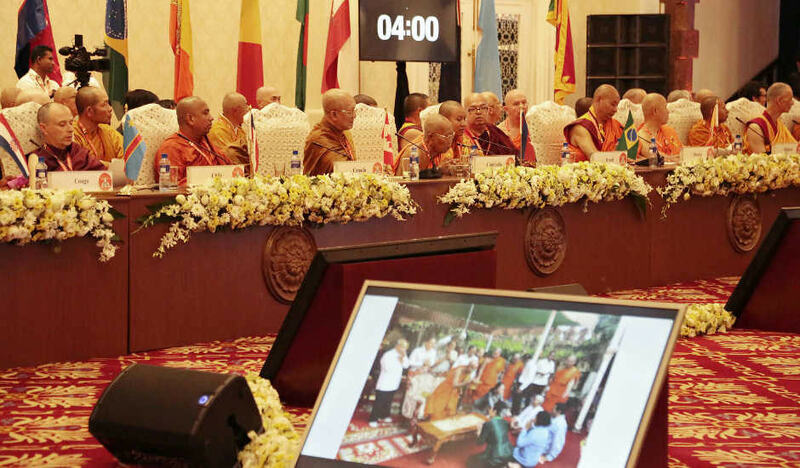 — Joint press conference conducted in front of many press corps from home and abroad after the closing ceremony of the Seventh Buddhist Summit. Organizing Committee members, Hon. 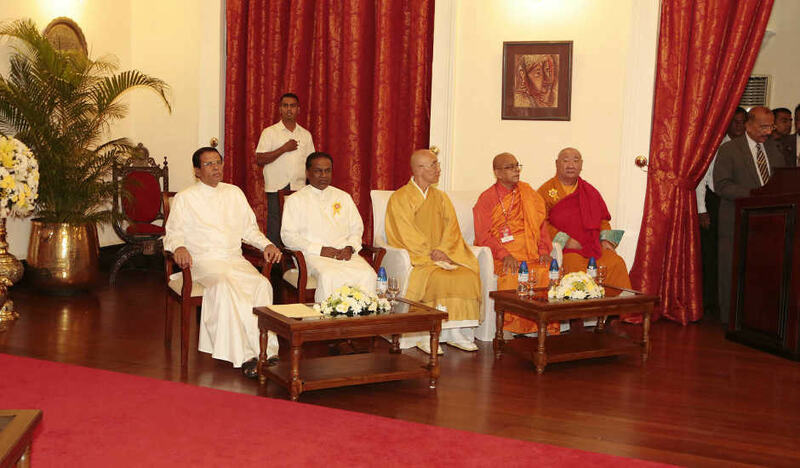 the Minister of Buddhasasana, and government officials attending the press conference. 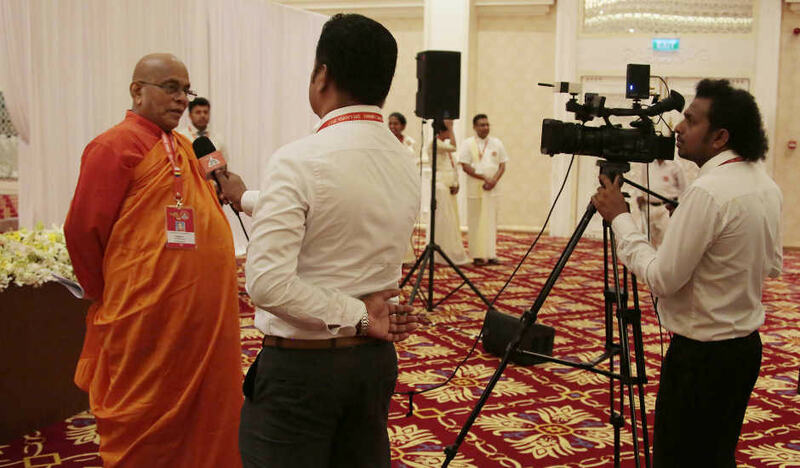 Secretary General of Buddhist Summit accepting an interview. 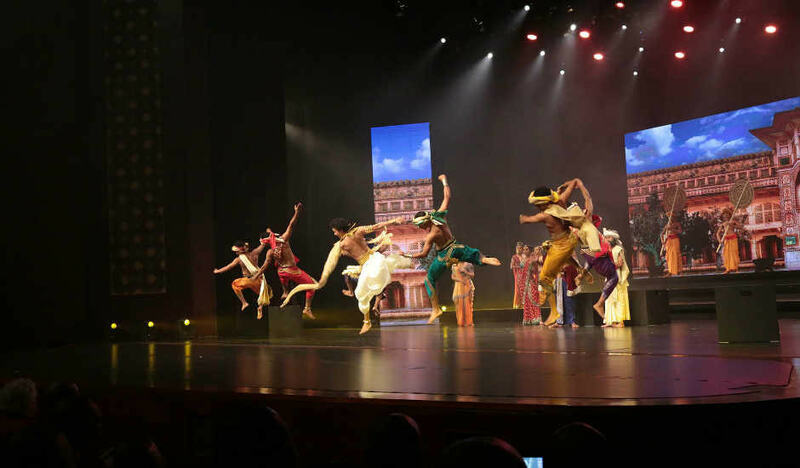 Impressive and wonderful dances and drama performances. Gazing intently at the stage. 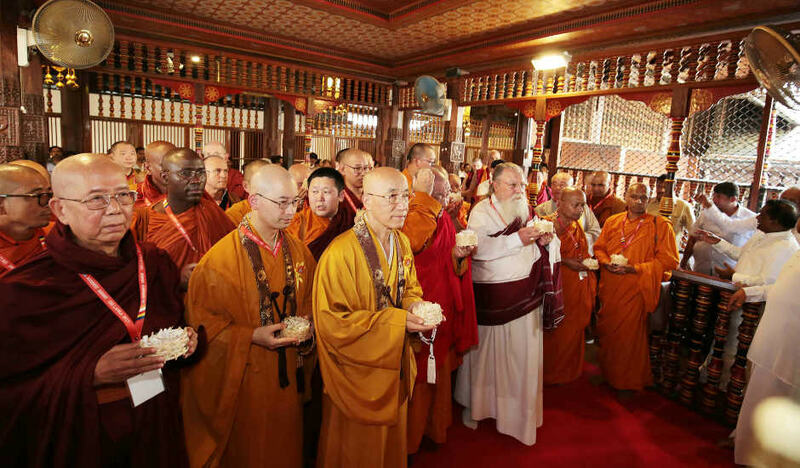 Supreme Buddhist leaders offering flowers. 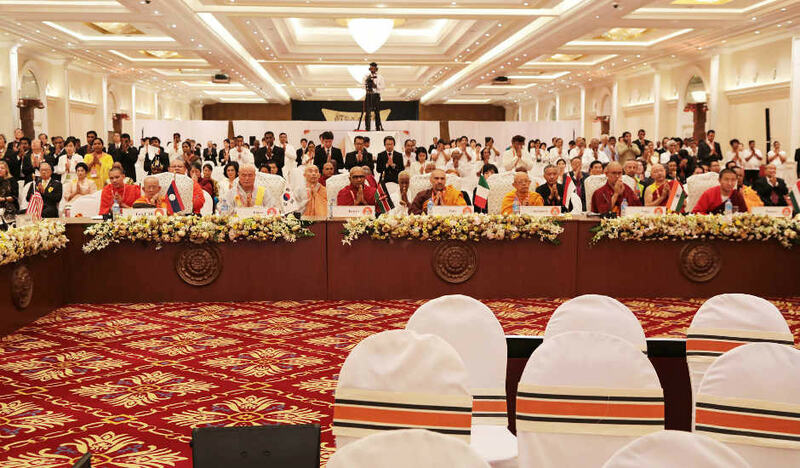 Special space for worship prepared for the representatives of the Seventh Buddhist Summit. 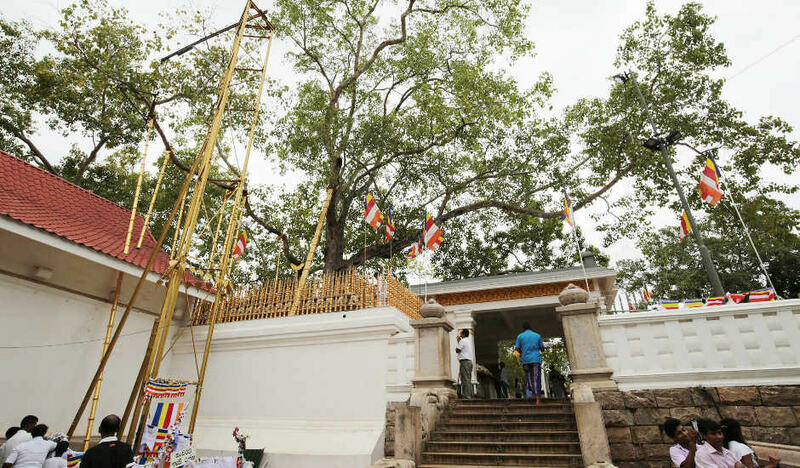 At Golden Temple on the foot of Dambulla Rock Cave Temple. 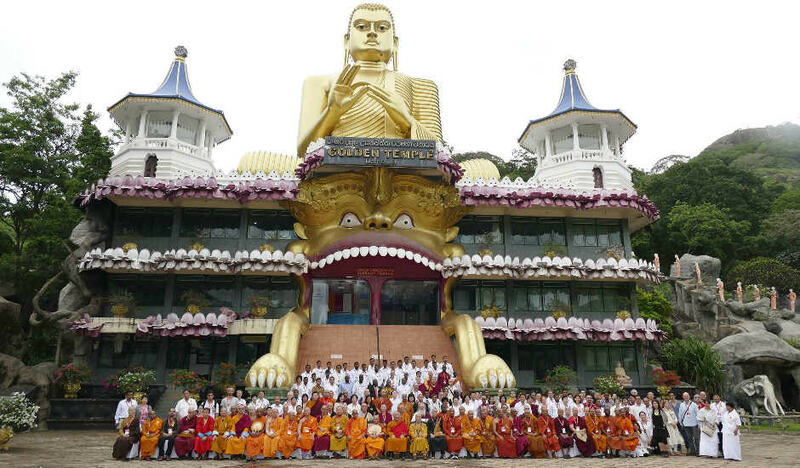 Taking commemorative photos against the background of the golden Buddha statue. 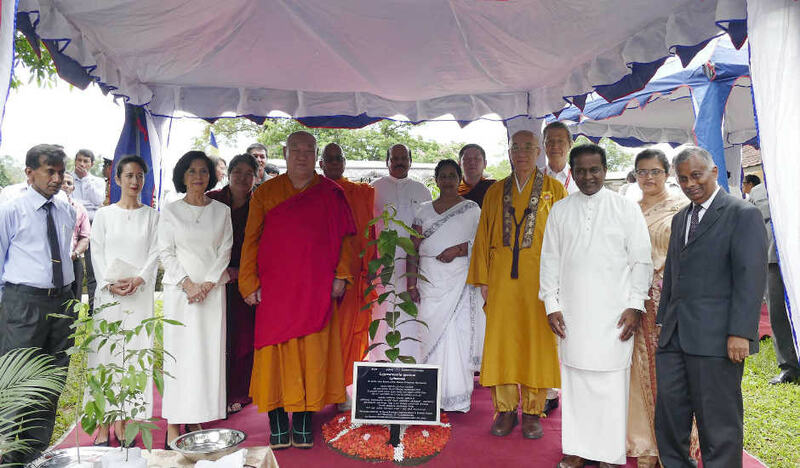 Planting a Bodhi tree of Most Ven. 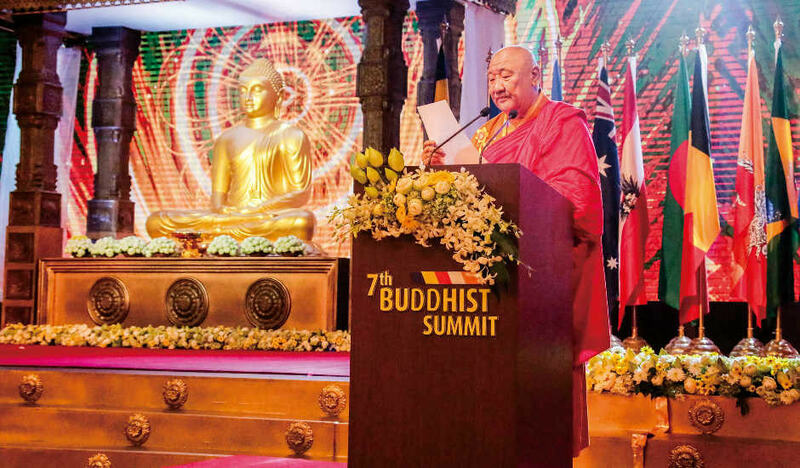 Dr. Kyuse Enshinjoh in commemoration of the Seventh Buddhist Summit at the Royal Botanical Gardens, Peradeniya. With Hon. 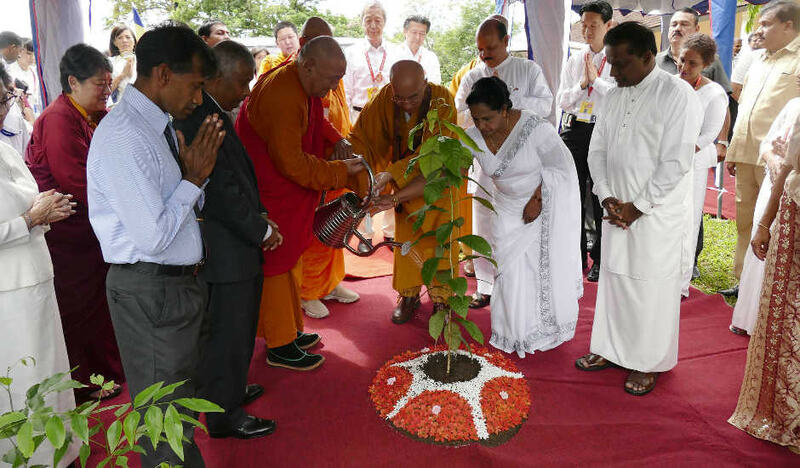 Madam Sumedha G. Jayasena, Deputy Minister of Sustainable Development and Wildlife, and Hon. 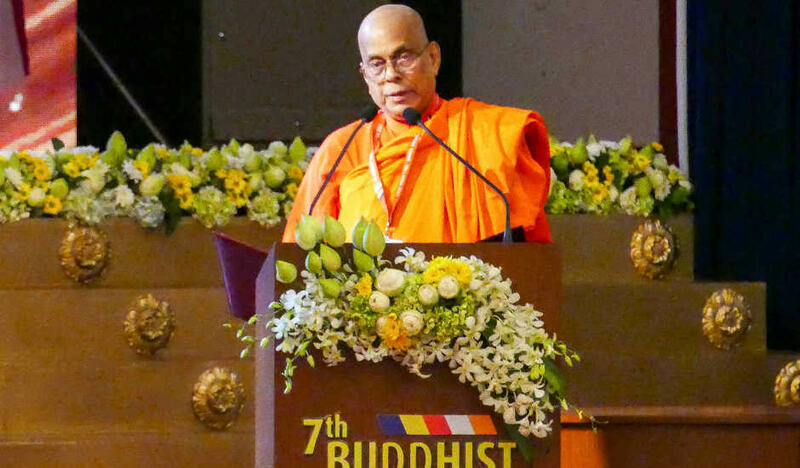 Sarath Ekanayake, Chief Minister of Central Province. 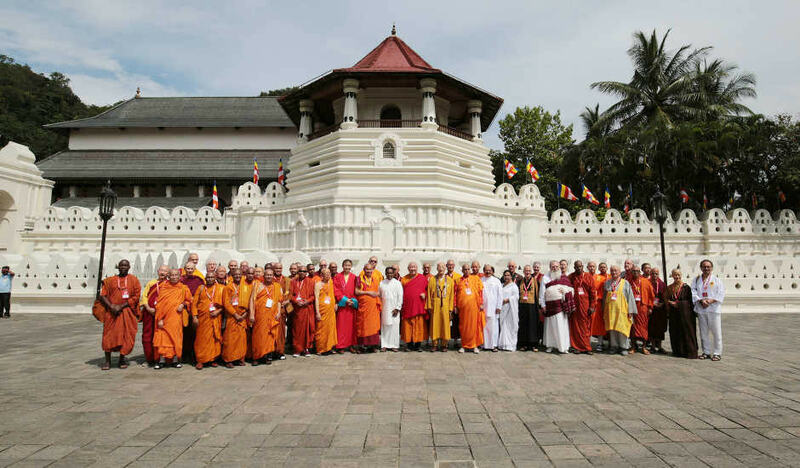 At Sri Dalada Maligawa, Temple of the Sacred Tooth Relic. 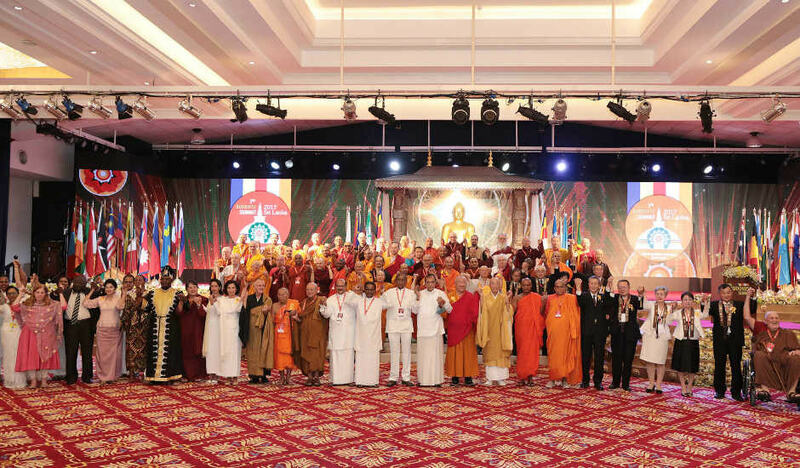 Commemorative photo is taken with the supreme Buddhist leaders of 47 countries in the world. 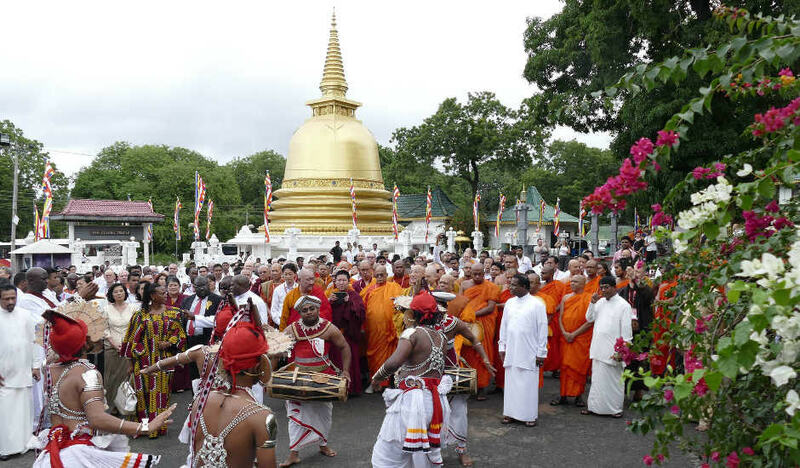 Supreme Buddhist leaders offering flowers to the most sacred tooth relic. 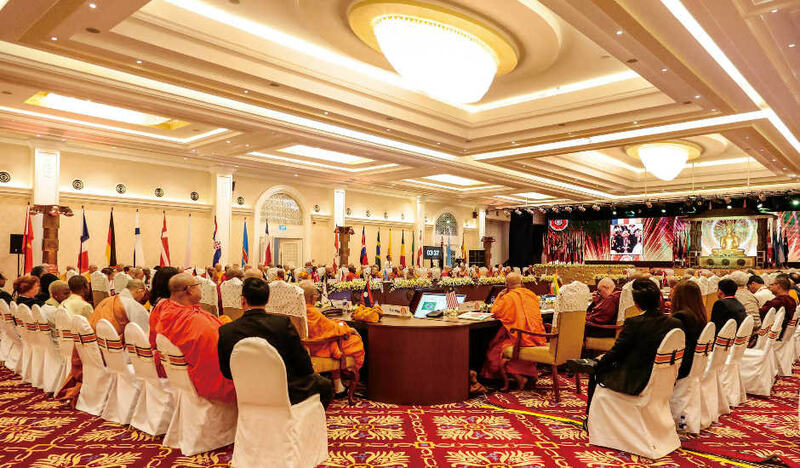 — Newspapers, TV, and the Internet extensively covered the Seventh Buddhist Summit held in Sri Lanka. 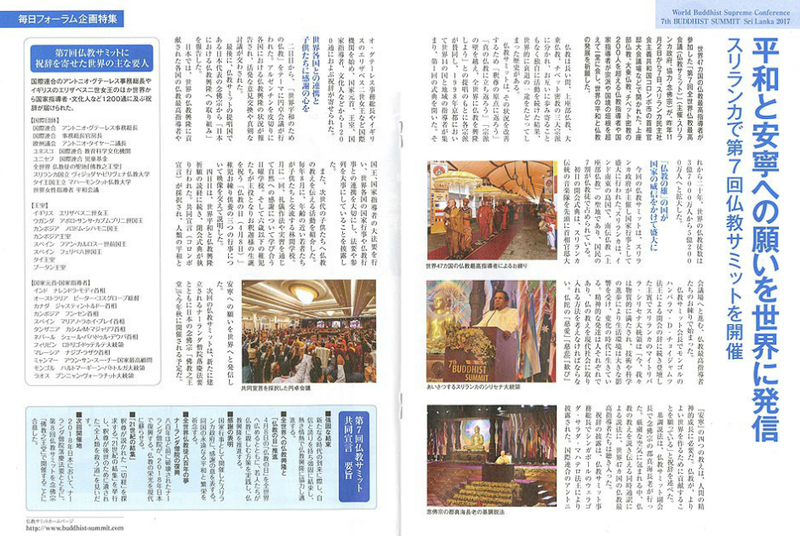 * Courtesy of The Mainichi Newspapers. All rights reserved. 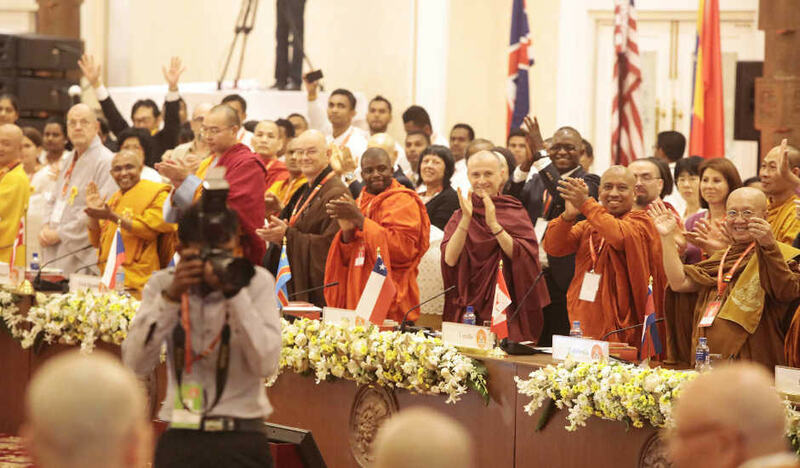 Copyright © 2014 - World Buddhist Supreme Conference All Rights Reserved.